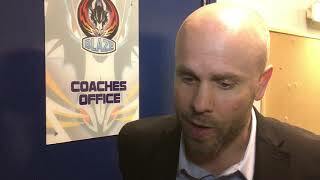 The Genting Casino Coventry Blaze left themselves with a mountain to climb going down 5-0 to the Belfast Giants in the Predictorbet playoff quarter final first-leg at the SSE Arena. 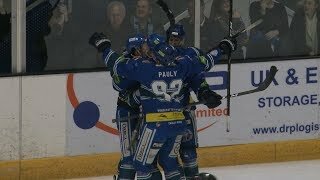 The Elite league champions went ahead at 10.58 when the league’s top goal and point scorer Darcy Murphy beat Matt Hackett, his first of three points on the night. In a second period dominated by the home side, two of Belfast’s late season signings Jordan Smotherman (23.56) and Chris Higgins (30.19) made it 3-0. In his final game at the SSE Arena, the retiring Colin Shields celebrated a 4th goal (42.19) before Jonathon Ferland wrapped up the scoring (49.41) to end the first-leg with a 5-0 advantage to Belfast. Head Coach Danny Stewart said, "They were just better than us in all areas. They were heavier than us, faster paced and better in the hard areas. Belfast elevated their game and we didn't match it. We have a hill to climb but we just have to chip away at it. We owe it to ourselves and our fans to put in a good home performance tomorrow."